The Phizzing Tub...: Discovery Made!! We never know exactly what we will find in our yard sometimes. Today I was treated to this fun find, a Nesquik stainless steel spoon! Actually, I am a bit surprised that I even found it. I was out filling the bird feeders when this shiny object caught my eye. As I looked down, I could tell that it was a spoon and instantly I thought back to when the boys were small. They would play for hours outside in their sandbox but I could not recall them ever taking a spoon into the yard. I bent down, pulled up on the silver looking object and was surprised at what I had found. Quickly I came back into the house, washed off the spoon with super hot water (and soap) then boiled it. 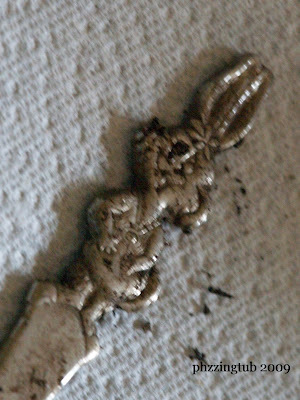 The top of the spoon has the Quik bunny, which I think is so cute. 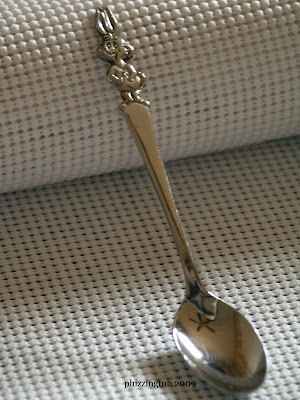 Now that the spoon is cleaned up it looks wonderful! I did a bit of surfing for information and could only come up with that it dates to before 1990. 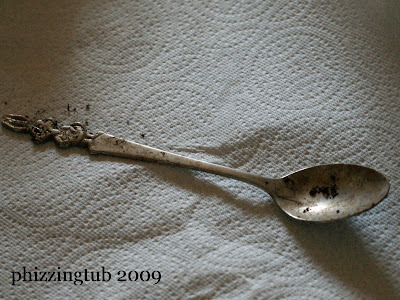 If anyone has any information about this spoon, I would love to hear from you.